Winaico PERC panels are now available from Positronic Solar. Although they are more expensive than the standard range, we believe the advantages make them a winner – particularly for small business solar systems where fitting a large array on a limited roof area can be a challenge. WINAICO is one of the first companies in the world to mass produce solar modules with Passivated Emitter Rear Cell (PERC) technology. Hence, it is no surprise that WINAICO became the first company to reach 310W in a 60 cell module with PERC in 2015. In this article, we will explain the underlying properties of the PERC technologies, and the key to breaking the 18.5% module efficiency barrier. The solar cell quality is central to the solar module’s performance. In order to push the module efficiency beyond 18.5%, WINAICO uses the highest efficiency PERC solar cells from Taiwan. The PERC solar cell structure shown in Figure 1 contains a passivation layer on the rear side, which is then perforated with laser openings. This creates a local Back Surface Field (BSF) around each laser opening, before an aluminium layer is screen-printed at the back to create the contact layer. As light energy hits a standard solar cell, not all energy is absorbed by it, where a small portion of light passes through the cell without being converted into usable energy, shown in Figure 2. On the other hand, the rear side passivation layer on a PERC solar cell functions as a power reflector, that reflects the excess light back to the solar cell for a second absorption phase, resulting in higher solar cell efficiency. The total energy in sunlight is the sum of energy across a wide range of wavelengths. Therefore a good solar cell technology needs to have excellent spectral response, across all wavelengths, matching the sunlight. When the sun shines on a standard solar cell, the shorter wavelengths below 500 nm (blue light) get absorbed by the solar cell, but the longer wavelengths above 620 nm (red light and infrared) may pass through the solar cell without being converted into useful energy. The extra reflector layer in the PERC solar cell is effective at reflecting infrared wavelengths longer than 1000 nm for a second absorption phase, resulting in better response than During low light (dawn and dusk) and weak light (cloudy) conditions, the shorter wavelength blue light gets absorbed by the atmosphere, allowing higher proportion of long wavelength light to reach the Earth. In such situations, PERC solar cells’ improved spectral response at long wavelengths allow the cells to perform better than standard cells, and maintain close to top efficiency at low light conditions, as illustrated by Figure 4. WINAICO’s PERC module is able to maintain close of 99% of its STC efficiency at 200 W/m2 irradiance level, while a standard solar module’s relative efficiency drops to less than 96% at the same condition. 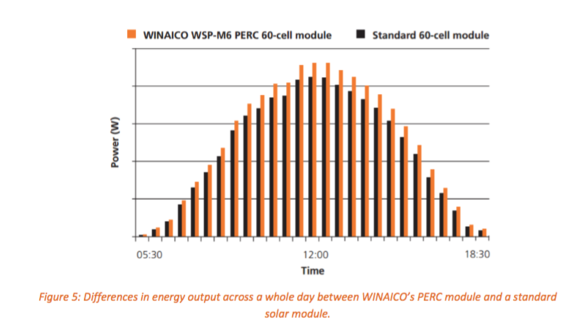 As a result, the energy output of a WINAICO PERC module is higher than a standard module across a whole day, shown in Figure 5. A PERC installation is known to begin producing electricity earlier in the morning and stops later in the evening than an installation of conventional solar modules. We’re committed to provide our customers with best quality service.